Thermal comfort is achieved when building occupants find the temperature, humidity, air movement, and heat radiation in their environment to be ideal. Thermal comfort is achieved when building occupants find the temperature, humidity, air movement, and heat radiation in their environment to be ideal.Significant research shows that interior thermal conditions, along with indoor environmental quality (IEQ), significantly can affect productivity and learning. ASHRAE 55 provides minimum requirements for acceptable thermal indoor conditions, but the challenge for design teams is to optimize ambient conditions to exceed this standard by taking into consideration the occupants, space, and ventilation. According to ASHRAE Standard 55, it defines meaning of success of thermal comfort in commercial buildings is that a building meets the needs of 80% of occupants. 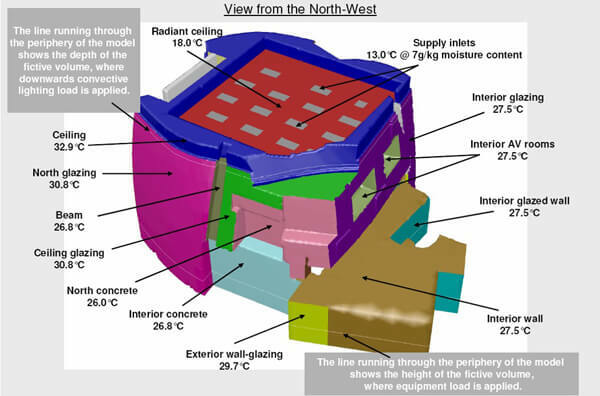 Since consideration both of energy efficiency and indoor air quality leading to more concentration on natural ventilation in buildings, the concept of adaptive thermal comfort emerged. Before we understand adaptive thermal comfort, firstly, we need to know adaptive model: that is a model relates indoor design temperatures or acceptable temperature ranges to outdoor meteorological or climatological parameters. The original papers on the adaptive model were published by Humphreys and Nicol in the 1970s when they were working for the UK Building Research Establishment. 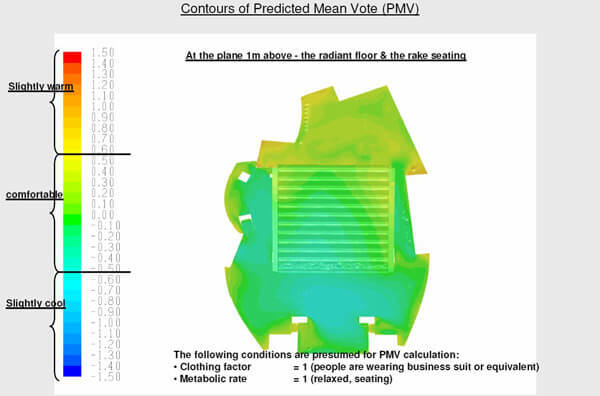 Their statistical analyses of comfort questionnaire data from building occupants are what we would now recognize as “adaptive models.” They described a strong relationship of “comfort temperature” (a.k.a. 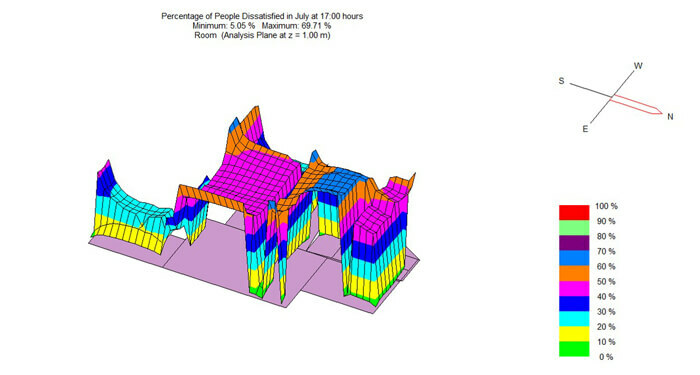 “neutrality”) inside a building, on the mean temperatures prevailing inside the building at the time of the survey. For naturally ventilated buildings and buildings operating in “free-running” mode the indoor comfort temperature was also noted to strongly correlate with the mean monthly temperature outdoors at the time of the survey. This concept suggests that people are able to adapt to the wider range of thermal conditions than is generally considered before. For instance, human can tolerate higher temperature even feel more comfortable when they are under hotter environment. 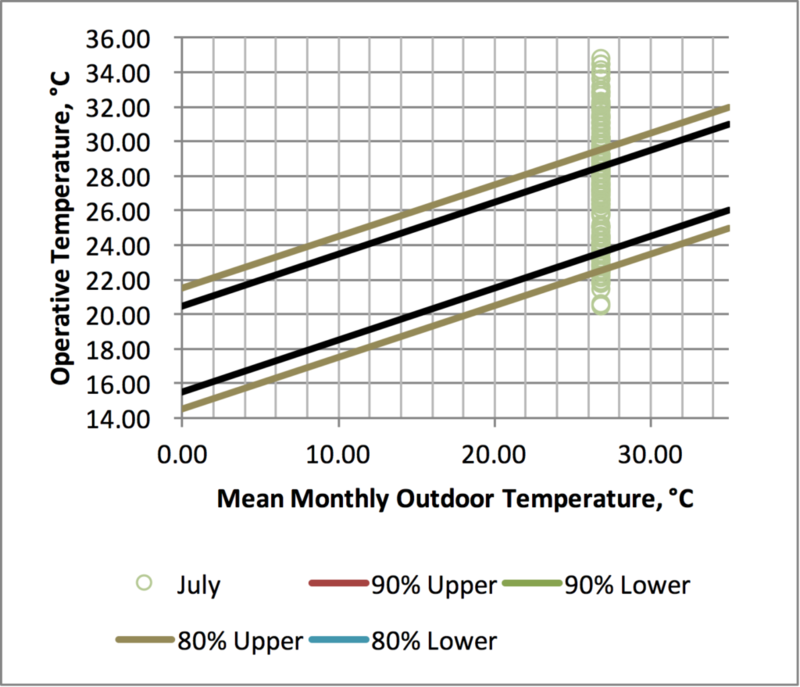 In addition, ASHRAE 55-2010 adapts mean monthly outdoor air temperature to evaluate the indoor comfortable operative temperature. However, the ASHRAE Standard 55 is not always as the same as before. In the latest ASHARE Standard 55 -2013, it replaces the mean monthly temperature with prevailing mean air temperature. On the other hand, for the EN 15251 Standard, it adapts the running mean outdoor air temperature to predict indoor comfortable operative temperature. Therefore, the purpose of this standard is to specify the combinations of indoor thermal environmental factors and personal factors to produce more acceptable conditions to a majority of the occupants. 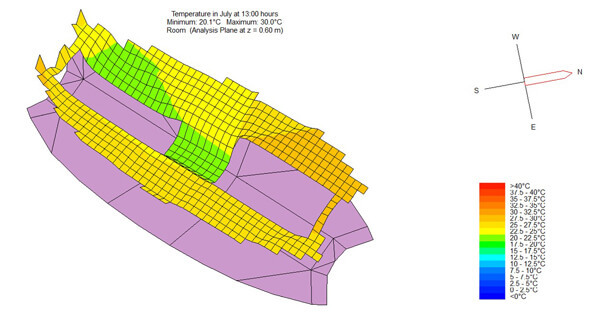 The objective of this paper is to apply real measurement in Yuetan Center in Beijing Financial Street to evaluate the adaptive comfort by ASHRAE Standard 55-2013 and EN 15251. 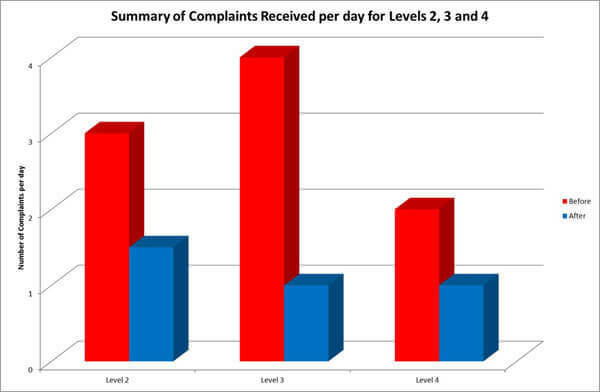 Then, we compare the difference in the results in two standards to offer suitable recommendation for practitioners. There is no mechanical cooling system. 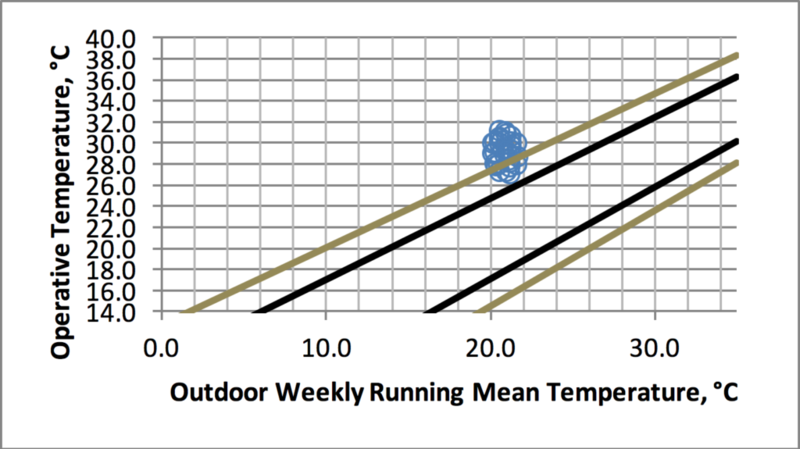 Representative occupants are free to adapt their clothing to the indoor and/or outdoor thermal conditions within a range at least as wide as 0.5 to 1.0 clo. 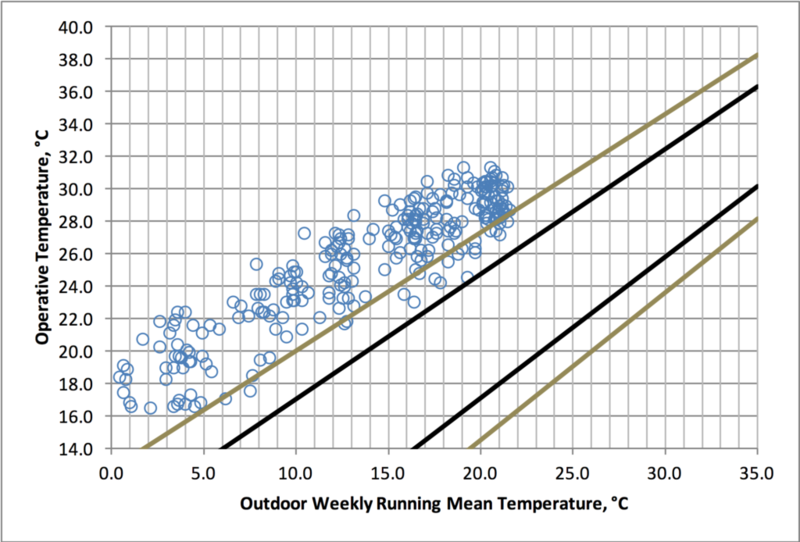 The prevailing mean outdoor temperature is greater than 10°C (50°F) and less than 33.5°C (92.3°F). Θed -2 is the daily mean external temperature for the day before and so on. 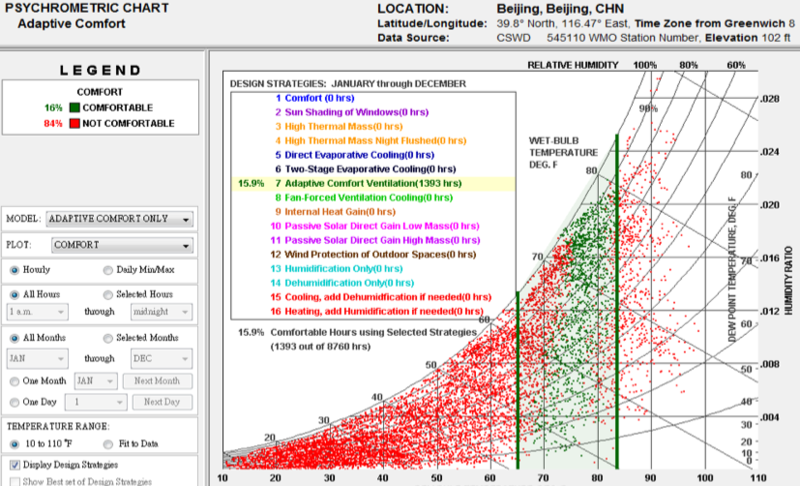 To compare adaptive comfort temperature in naturally controlled building, we chose Yuetan Center in Beijing. 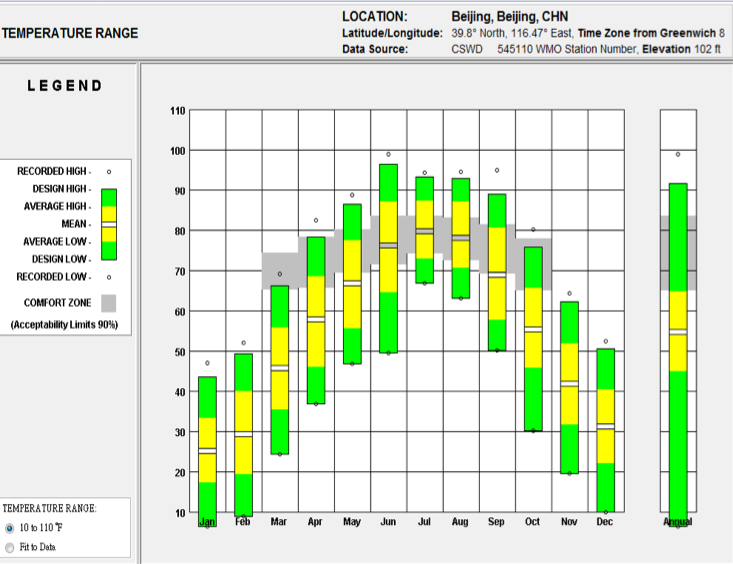 The climate in Beijing is of the continental monsoon type with cold and dry winters and hot and humid summers. 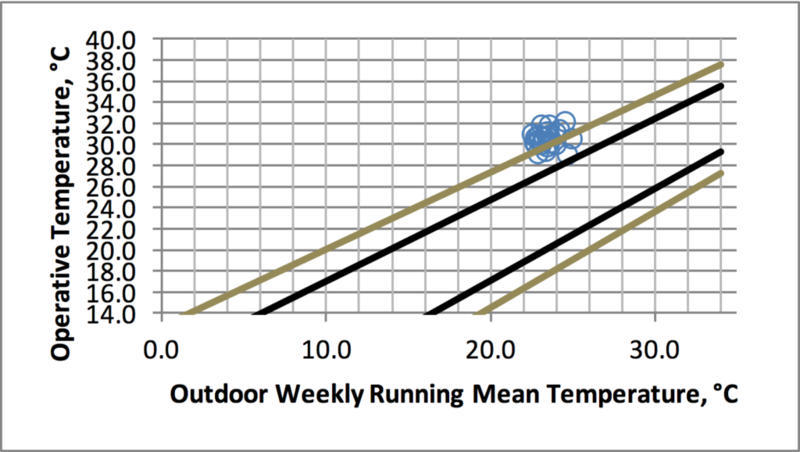 The range of temperature is wide and the adaptive comfort hours are 1393 hours in Climate Consultant Software from Figure 2 and Figure 3. 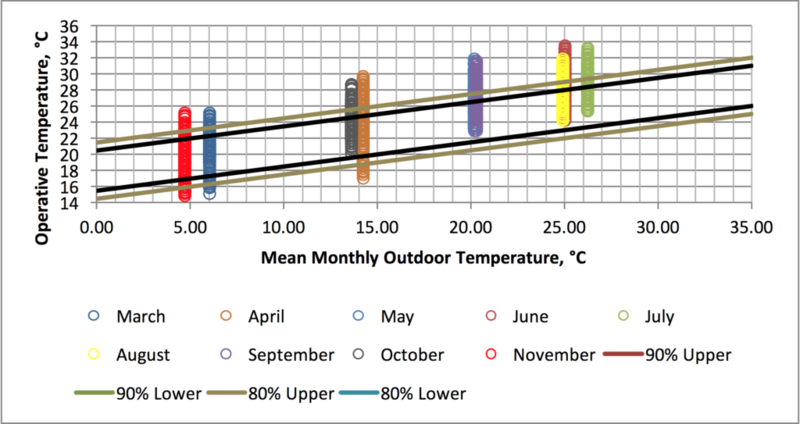 In terms of ASHRAE 55, we picked the months from March to November, and the mean monthly temperature and acceptability limits is in Table 1. According to the Figure 4., most of measurement is in the adaptive comfort zone within 80% satisfaction limit boundary. 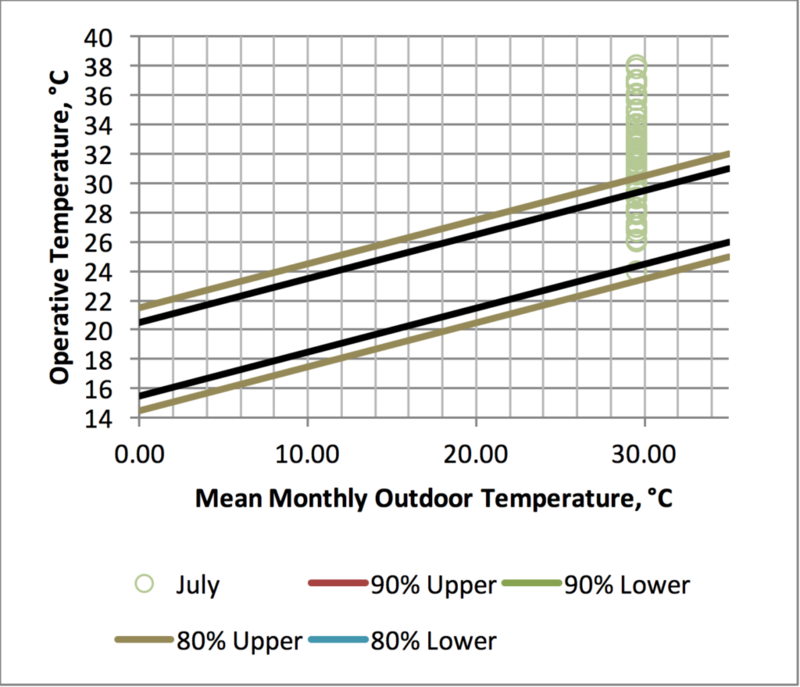 However, most of the data measurements applied in EN 15251 are above the upper 80% acceptability limit, and the indoor operative temperature is too high for people based on the thermal conditions from Figure 5. 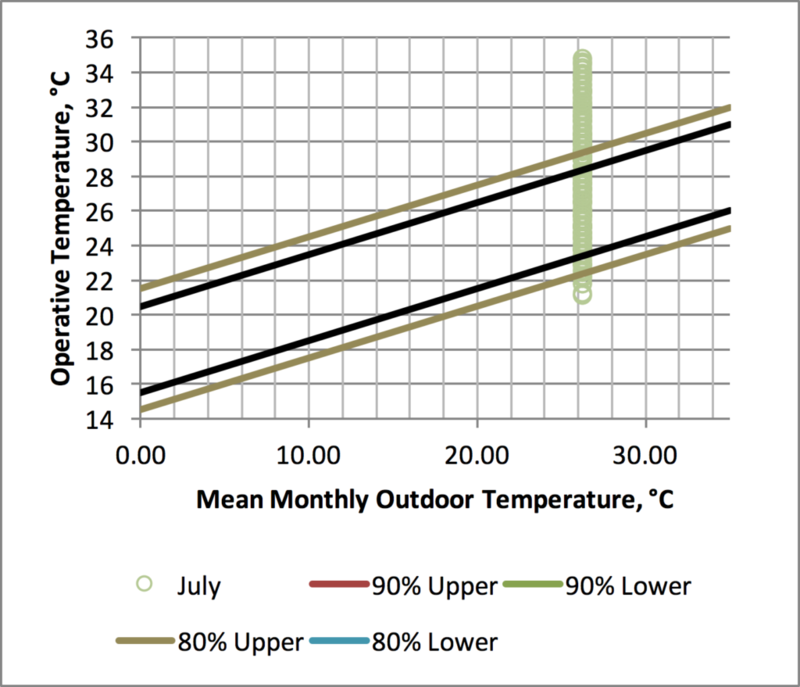 Besides, we also used the weather measurement and indoor operative temperature in Shanghai, Shenzhen and Taipei in July. 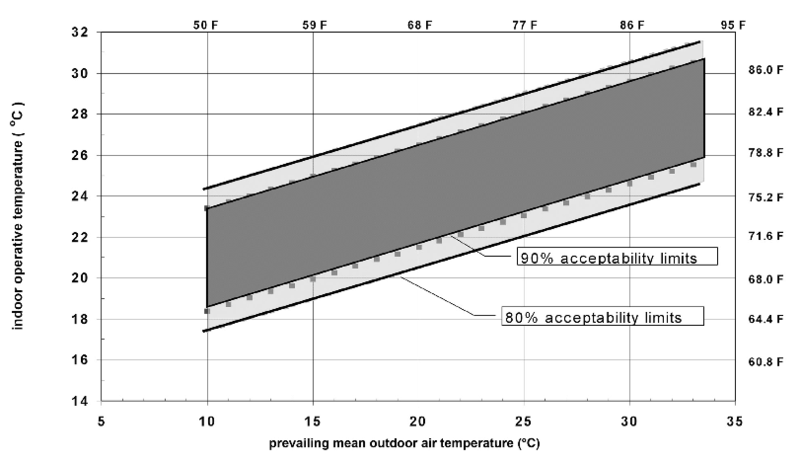 For ASHRAE 55 Standard, although part of measurements is out of acceptability zone, there are many points in the 80% and 90% acceptability area from Figure 6 to Figure 9. 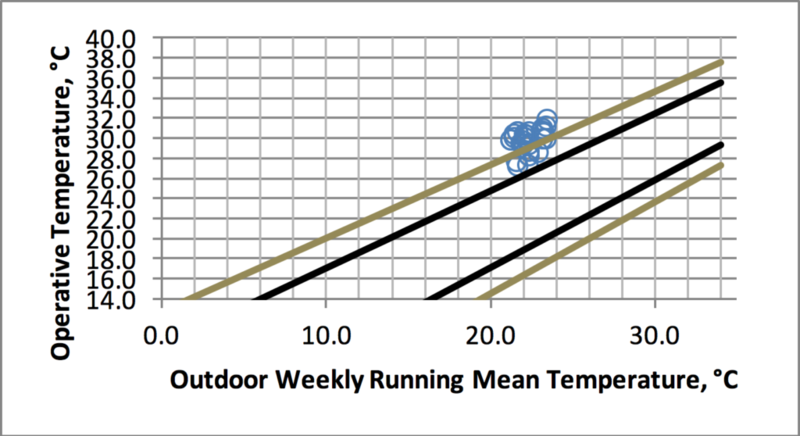 Nevertheless, when we changed the ASHRAE Standard-55 to EN 15251 Standard by using outdoor weekly running mean temperature, although a small part of measurement is between upper limit 80% and 90% acceptability, the measurement points are almost out of 90 acceptability area. Moreover, most of measurements are above the upper 80% acceptability limit. Standards interpret the data measurements in different ways. According to the results in ASHRAE 55-2010, the data measurements of existing building mean that people usually would feel satisfied that thermal conditions, even they are in different cities where there are with diverse climate. However, it shows the opposite results when we adapted another EN 15251 Standard, and people almost feel unsatisfied the thermal surroundings. 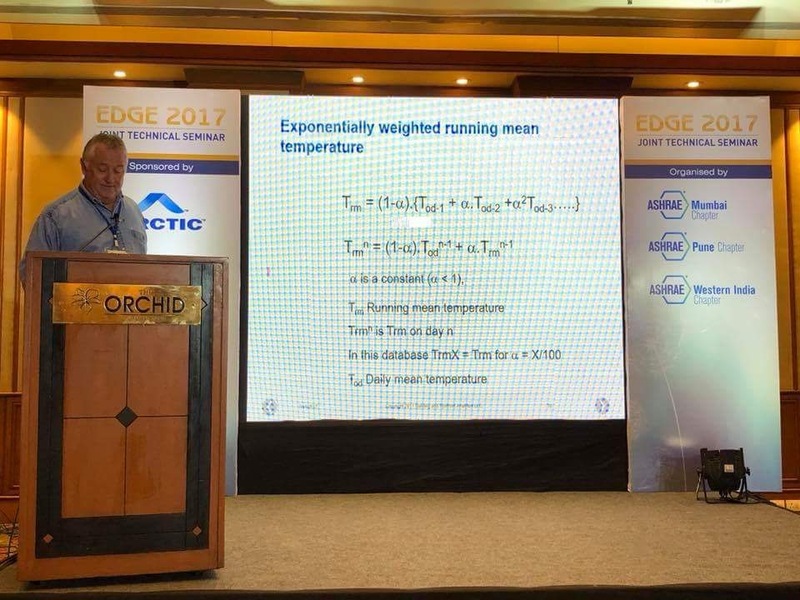 That means, for naturally controlled building with present temperature set points, designers should not be totally convinced by the past standard, and they should rethink about what is the proper design for indoor operative temperature based on ASHRAE 55-2013 and EN 15251 Standard.